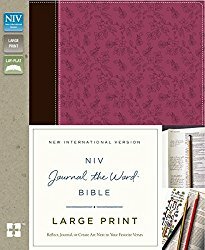 I’m happy to say Karen is the winner of the NIV Journal the Word Bible Large Print Edition. (You’ll find my full review at this link.) Thank you Karen for reading grandma’s cookie jar (please email me your address at lyndagcj@gmail.com by January 27, 2017, so I can have it sent to you) and thank you Zondervan for sending one for me to review and for making another available for me to give away!